Since Eithne asked about my labels, I thought I'd do a quick post on them. I got them from Name Maker, and they are style F2. The label is a cream color and the font is silver (the colors are customizable). They were $22 for 50 labels. Name Maker has really revamped their site (for the better) since I ordered these; I see that they were featured in a Martha Stewart magazine so that's probably why. When I ordered these a couple of years ago, I was engaged to be married, and at that time I wasn't sure if I was going to keep my last name or take Tim's last name. 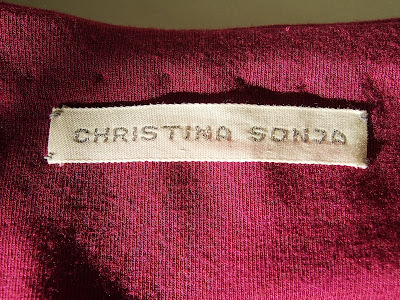 So I decided to just use my first and middle names, Christina Sonja. This has kind of stuck as my sewing moniker. Nobody actually calls me that. Thanks for the info. I have some crappy iron-on labels right now and really want to upgrade. I also use my first and middle name for crafting/sewing/blogging but in real life I just go by Stephanie. I'm looking forward to seeing the Cosmo dress. Those are very cool... I must order some too! Here's an option for those of you looking for labels. I recently ordered my labels from nwtag.com and I am very happy with them. My labels are posted here http://www.flickr.com/photos/maluhia/511273634/ and for 1,000 polyester labels it was $94 that includes shipping and one time $25 plate fee. It took 3 weeks from the day I faxed it in to the day I received it. So far, they are the most reasonable label company that I found. Wow, that is an amazing deal, maluhia! That sounds great for businesses who are producing lots of goods. I, on the other hand, doubt I will ever use 1000 labels in my lifetime, although I will certainly try! I love the little daisies! !